Although the people of the East End couldn’t have known it, today in 1888 saw the final outrage by the killer who all them now knew as Jack the Ripper. By the early hours of the 9th November Mary Kelly had been drinking heavily and was, according to witness who saw her, “very drunk. One of her neighbours, Mary Anne Cox, had seen her taking a man into her room at 13 Miller’s Court at a little after midnight and, almost immediately, had heard her singing the song ‘A Violet I Plucked From My Mother’s Grave When A Boy’. Another neighbour, Elizabeth Prater, who occupied the room directly over Mary’s, had been awoken between 3.30am and 4am by her cat jumping on her bed. As she pushed the cat off she herd a faint cry of “Oh” Murder!” However, such cries were not uncommon in the area, where drunken brawls and domestic abuse were rife, so Mrs Prater presumed it was just another fight and went back to sleep. Mary Kelly was behind with her rent and, at 10.45am, John McCarthy, her landlord, sent his assistant, Thomas Bowyer, to her room with instructions to ensure he got some money off her. Bowyer duly marched through the arch of Miller’s Court and banged on Mary Kelly’s door. There was no reply. He knocked again and still got no reply. Convinced that Mary was in the room, but avoiding him on account of her rent arrears, Bowyer marched round to the window, a pane of which was still broken following Mary’s altercation with Joseph Barnet, her live in lover until a few weeks ago. Leaning forward Bowyer pushed the newspapers and rags of of the break and moved aside the old coat that was covering the pane. McCarthy’s initial reaction was one of horrified disbelief. “You don’t mean that?” Bowyer nodded that he did and the two men raced into Miller’s Court where, a few moments later, John McCarthy was stooping down and squinting into the gloom of the room. There was, indeed, a lot of blood. In fact, the wall behind the bed was covered in it. A pile of bloody flesh appeared to have been stacked up on the bedside table. 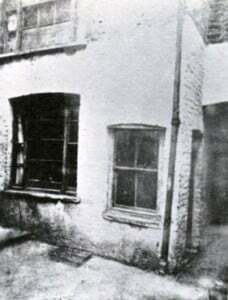 But, most gruesome of all, on the bed itself lay the body of Mary Kelly, much of the flesh cut down to the bones. Recovering his composure, McCarthy sent Bowyer to fetch the police and soon Inspectors Walter Dew and Walter Beck were at the scene. As the police waited to go into the room, a photographer arrived and photographed the crime scene. That photograph still exists and, looking at it today – separated from the bloodbath by the passage of over 120 years – it is still difficult to view it and not feel sick. Throughout the afternoon of the 9th November 1888 Dr. Phillips and Dr. Bond examined the body as it lay at the scene of the crime, whilst the police searched the room for clues and quizzed those who lived in Dorset Street to see if they could glean any information about the killer’s identity. The news that the body was about to be removed caused a huge number of people to rush out of the courts that ran off Dorset Street and the police struggled to hold the throng of onlookers back. But, as the coffin, draped in a “ragged-looking cloth” was carried from Miller’s Court, the crowd fell silent. “Ragged caps were doffed,” The Times reported, “and slatternly-looking women shed tears” as the body of Mary Kelly was taken away to the mortuary where doctors would do their best to piece it back together again.